UPDATE: Four Years after the original post, I’ve edited this with the latest information and new resources. Hello. My name is Angie and I’m a mother of allergic children. The struggle started early in my mothering career, during a time when I functioned as a single parent due to long deployments. Dietrich’s allergy story begins shortly after starting solid foods (maybe even earlier as he’s always had eczema). Without warning, for seemingly no reason, he would throw up everything he’d eaten all day up until that point. I took out the most obvious thing I could: dairy. I even had a basic pediatric panel in October 2009 and a skin test for milk. Milk did not react though he showed a severe allergic reaction to cats and dogs. The mystery remained unsolved. The problem was sporadic at best but occurred often enough that I knew it had to be a common ingredient. Early on, I discovered that he didn’t tolerate peanuts, in part because he would refuse something obviously peanut-y but also because he would throw up even a teeny tiny pinch of a granola bar that might contain traces of peanuts, so I avoided them. These unaccounted for episodes, however, involved an immediate rejection of the food – and anything else remaining in his digestive system. When I look back, I believe he only survived that period by Pediasure, Pedialyte, and the grace of God. As soon as he turned two, I went to our pediatrician and received a referral for a pediatric allergy specialist. Now, this pediatrician was otherwise useless, giving me no help or feedback, but he at least gave me the referral when I asked. The allergy testing revealed a 4++ reaction to eggs and peanuts. At that time, he showed a minor reaction to wheat, and the allergist advised me not to remove it from his diet unless we saw any reaction, or he wouldn’t be able to eat it again. Egg allergies are outgrown 80% of the time, vs. peanut allergies being outgrown only 20% of the time. About a year later, I made fish for supper. Dietrich had previously eaten fish without any problem. On this night, he began to swell and break out in hives. I checked the marinade, something new, but couldn’t find any contaminate there. We gave him Benadryl and watched him closely. I decided to conduct an experiment by preparing fish the same way as I had previously, without the marinade. Dietrich had the same reaction. Since he was due for an allergy follow up, I had them add fish to his testing. All white fish came back 4++. His other allergies were also still present at that time. The hardest part of his story happened in the year and a half following the allergy diagnosis. I had to retrain Dietrich how to eat. He basically quit eating anything that made him sick before. We’ve since added another child who is also allergic to peanuts. Here are just a few of MY lessons, in addition to the many others that can be found on other blogs. The biggest and most important thing I want all people to know about allergies is that the allergic person doesn’t always respond to the allergen in the same way, every time they are exposed. For us, Dietrich could eat more baked goods in Germany. My belief is that it has to do with fresher, less processed ingredients. He could eat a bakery product, even one made with eggs and not get sick. However, if he ate a packaged cookie containing egg, he would get sick every time, no matter where it was manufactured. (He may occasionally have decided it was okay to eat such things at the Kindergarten. He did eventually learn better, and I did set up a good working relationship and overcome the language barrier with his teachers to accomplish keeping him safe). Don’t put food on my child’s plate. Shortly after his allergy diagnosis, a very well-meaning, though pushy, lady at church put a cookie on his plate, in the potluck line, without asking me, because “every boy needs a cookie”! I may have screamed, or at least spoke more loudly than intended when I said, “NO, HE DOESN’T!” I explained why, but I don’t think my initial reaction was very graceful. Generally speaking, I think each parent should only tend to their own child’s plate unless someone else is specifically helping that family and knows that family’s needs. I haven’t gone the route of quitting potlucks. Sometimes I bring a dish and a packed lunch for Dietrich, but I don’t think he minds. He doesn’t really know any different. I always make sure to bring a dessert that is safe for him. The little line that says “may contain traces of…” sometimes matters as much as if the ingredient is present in its whole form. Dietrich is that sensitive to peanuts. I know which brands of chocolate chips are trustworthy and those are the only ones I will buy. This line is optional, companies are not required by law to include it. I’ve learned which brands are safe through research and sometimes very unfortunate trial and error. Baby foods and toddler foods for “convenience” contain egg whites (even though some pediatricians still recommend delaying the introduction of eggs until after one year). I was livid when I read the labels and discovered this. You cannot overplan for traveling. Whether a road trip or a flight, I prepare and pack anything I think we might need. Snacks, sometimes even meals, all medications, and a doctor’s note with our allergy plan come with us anywhere we go. For more information of flying with food allergies, check out this article. Dietrich is nearing eleven now and Madilynn is six. As of yet, Dietrich hasn’t outgrown his allergies. We strictly avoid peanuts and all tree nuts. We are blessed with a circle of family and friends that help us keep the kids safe. Both children know their allergies and ask about what is safe and what isn’t. Dietrich even reads labels recognizes the familiar brands. Even though they experience some sadness about what they can’t have, I don’t think anyone is really missing out because we make everything a specially made treat. All events require extra work on my part but it’s worth it! 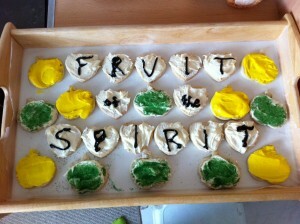 VBS treats that are egg and nut free! Wow! I did know bits and pieces of D’s story (from our conversations), but now I know “the rest of the story” as Paul Harvey would say. Dietrich is such a great kid. His birthday cake, by the way, was delicious. I doubt he missed the eggs. You are a great mom and I know you go above and beyond to make special D safe treats. He will grow up appreciating you for this! Changing the way I do things has been the hardest part but I have learned so much in the process! I am grateful for all the friends we’ve met along the way to encourage us and support us – especially when they don’t understand what we are going through other than by “second-hand” stories.